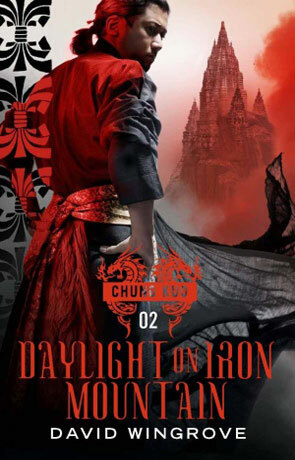 Daylight on Iron Mountain is the second book in David Wingrove's epic re-imagining of his Chung Kuo series and follows on from the events in the incredible novel Son of Heaven, I seriously recommend you read that novel first. Although we still have the characters of Jack, Mary and their family - who are given a large story arc of their own, the emphasis and larger story arc is firmly placed on the ruling Chinese families which include the Emperor himself Tsao Ch'un and the seven "Dragons" who are essentially the Emperor's most trusted advisors and heads of the seven most powerful families. Much of the world is now under the control of the Han but there are still pockets of resistance in the Middle east and America remains unclaimed. The famous poet general Jiang Lei finds himself appointed the task of leading the final war to subjugate the vast sprawling country of America, which since the collapse has become a land of separatist states ruled individually. Within the world-city that is Chung Kuo change is in the air and as Tsao Ch'un gets older his deep seated paranoia grows while his tenuous grip on sanity slips. I was again impressed with the sheer depth and sense of immersion that the author manages to impart on the pages, the knowledge and research that must have gone into creating this book and the series itself is quite staggering. The result is a realistic and sobering feeling of a dystopian future that has all the more power due to the fact that it isn't actually very far fetched and is the most likely post-apocalyptic scenario I have read - managing to combine a real sense of future intermingled with the vast traditional history of the Chinese Empire. I loved the way the author deals with the inevitable problems that arise from a monarchy and the character of Tsao Ch'un is wonderfully off the wall and utterly ruthless. The book is just full to the brim of politics (both corporate and state) intrigue, scheming, power struggles, violence and war with a big cast, fast pace and very little let up from the word go. There is no wasted space here at all, every word and every action carefully considered while the story spans over 30 years from start to finish. There is a very strong message about the dangers of giving so much power to so few, with a real ruthless and violent edge where those in power can do almost anything they wish with a great deal of impunity. This of course leads to extreme forms of corruption, something which is played to great effect in the latter part of the book. There are other messages present too including those of racism, sexism and abuse of technology, all handled with a degree of skill and maturity. The huge world spanning city of Chung Kuo is described in much more detail, the huge blocks which are graded so that the more affluent you are or the more respected, the higher within the city towers you live with the ultimate achievement being to reside on the first floor. The perception of the vast distances this city covers is handled very well, as is the feeling of living in a place where you never see the sun or any effects of the weather. Characterisation is superb, full of human strengths, weaknesses, passions and emotions and then placed into situations that test them to the very limit - even the incidental characters are given this edge. The two main arcs do a very good job of breaking up the story and the ending is incredibly powerful. I can honestly say that I loved every minute of this book, it's such an incredibly rich and immersive journey full of characters who seem so real you could reach out and touch them. Chung Kuo is already turning out to be one of the finest science fiction series of this millennium. Written on 1st November 2011 by Ant.